At the first farmers’ market of the new year, one of the growers brought mâche…a beautiful and delicious lettuce that has at times and by some been considered a weed (because of its tendency to spring up in the fields where corn and other cereal crops are grown). As with most things food, the French know better and have been eating it for a long time. 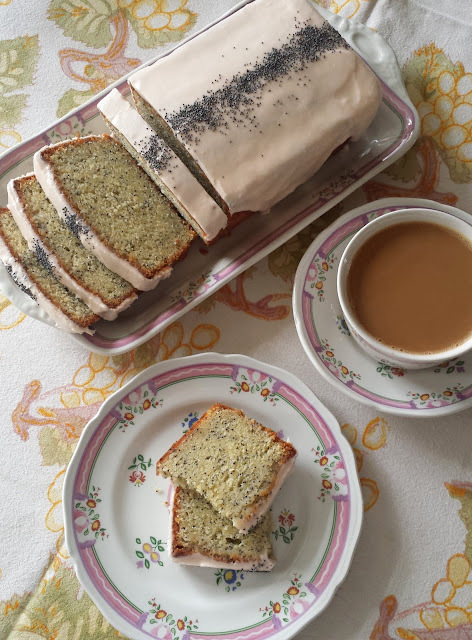 Patricia Wells tells us in her book At Home in Provence that it was shepherds who first brought it to the table—having observed their flocks nibbling on a patch with gusto and having decided to give it a try. Two of the other names for mâche reveal these interesting bits of lore: corn salad and lamb’s lettuce. By whatever name you know it, if you have tasted it, you probably think it is delicious—slightly nutty, with a soft, buttery texture. As I think about it, I am surprised this is the first time I have noticed it at the farmers’ market—I assume anything that could be construed as a weed would not be too difficult to grow. It is of course possible that I have just missed it. Mâche is a cold/cool weather crop and this is the first year that I have regularly patronized a winter market. When I saw it, even though I didn’t really know what I was going to do with it, I grabbed a box. I love mâche…and this was a pristinely lovely example of it. It is true that I occasionally see a box of Organic Girl mâche at the grocery store. But it is not regularly available. And while it is generally a good product, as with most things, it can’t really compare to what a local grower can provide. Whereas the mass produced stuff can be flimsy and succumb to decay fairly rapidly, the rosettes I purchased had a substance and life that kept them in fine condition for more than a week (stored air-tight, with a barely damp paper towel)… Plenty of time to decide how I was going to best enjoy it. In the end it was a salad in Patricia Wells' aforementioned book that provided my inspiration. I was thinking about the mâche…and what I was going to make with it…one evening while I was shopping. In my mind’s eye I saw a picture from her book. It included mâche rosettes, along with the classic trio of Belgian endive, walnuts, and Roquefort. I had everything but the cheese, so I grabbed a wedge. 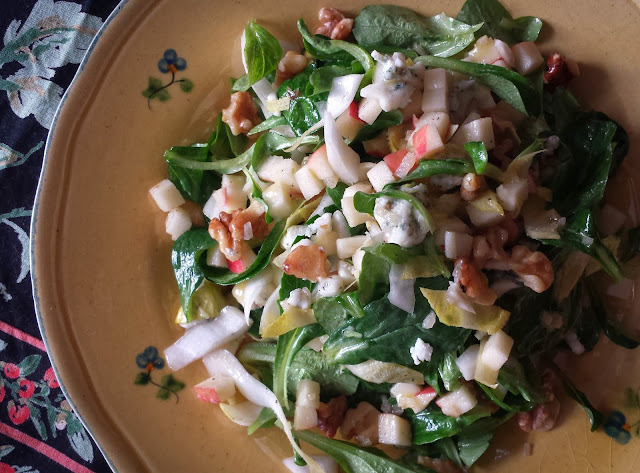 When I finally made my salad, I decided it needed a bit of apple, so I diced up a Pink Lady and added it along with everything else. Pink Ladies are my favorite snacking apple…and thus something I always have on hand…but Honeycrisps would be equally good. The crisp, juicy, sweet-tart apple was the perfect touch. Patricia Wells uses a cream based dressing for her salad, but I chose to use a tangy mustard vinaigrette that I already had on hand (you may have it too, if you have made the other apple and endive salad I posted a month ago…). If you have never tasted mâche, I hope you will seek it out. If you are unable to find it, I think this salad would be delicious with arugula instead. Many people suggest substituting watercress for mâche. But I think the nutty character of arugula is more in keeping with the flavor profile of mâche. Watercress can be quite peppery—and I don’t find mâche to be peppery at all (slightly bitter, perhaps…but not peppery). That said…watercress would probably be delicious in this salad…different…but delicious. To be honest though, I hope you won’t have to find a substitute. I hope that a grower at your market has some exceptionally beautiful mâche…so that you will have the chance to experience this delightful little green at its best. To make the salad, trim the root ends of the mâche rosettes. It is ok to leave the rosettes intact, as long as there is no root attached. You may also trim them in such a way that the leaves are all separate. I like to trim it so that the larger leaves are separate and a few small rosettes remain. Wash the apple. Halve lengthwise and remove the core. Cut each half into a neat quarter inch dice. Remove any bruised outer leaves of the endive and discard. Halve the endive and remove the cores (by cutting a "v" shape around the core on each half with the tip of a paring knife). Place each half face down on a cutting board and slice 1/4-inch thick on a short diagonal. 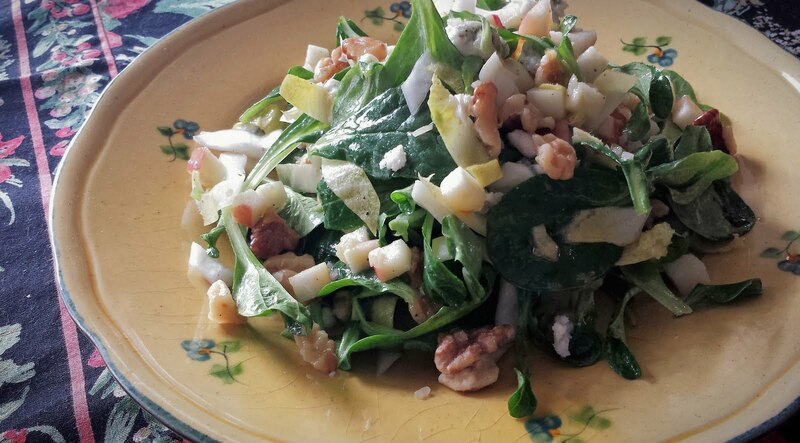 Place the mâche, apples, endive and walnuts in a large bowl. Crumble in the Roquefort. Drizzle with some of the vinaigrette and season well with salt and pepper. Carefully toss so that all of the ingredients are thoroughly coated with the vinaigrette. Add more vinaigrette as needed. Taste and correct the seasoning. If the salad seems well-seasoned and well-dressed, but still tastes a bit flat, give it a squeeze of lemon and toss again. Mound the salad on a platter or divide among individual salad plates. Serves 4 to 6. Note: The mâche and walnuts may be prepared ahead. The apples and endive must be cut right before serving as they will both oxidize after being cut.